Greenland, Warming Island, off coast of Liverpool Land, Warming Island Map, 2006 - This map was in use at the airstrip at Constable Pynt in Sept 2006. It shows Warming Island as part of the mainland of Greenland. 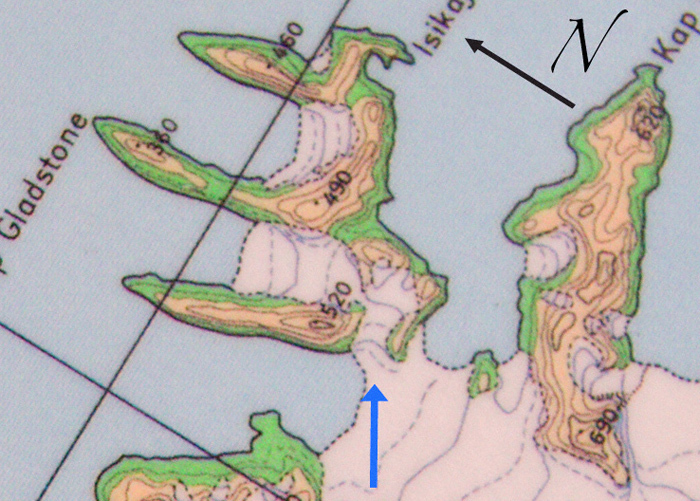 The blue arrow shows the point at which the glacier fell away to the sea, thus creating the world's newest island, which Dennis Schmitt, its discoverer, named Warming Island in Greenlandic. We camped for six nights at the base of the peak labeled 520 (meters) in the saddle between it and the peak labeled 490, in the direction of the blue arrow. The entire glacier fell away, creating a new strait that left Warming Island completely surrounded by the sea. The strait was approximately 150 meters across at its closest point. The ice shelf falling to the sea was obviously old ice, perhaps thousands of years old.